Basket size: 9 in. x 5 in. at rim; 8 in. tall. Please print this FREE pattern and share with your friends. This little Basket Handbag is named in memory of Marie Levan, Marsha Holm's niece, who lost her 2 year battle with cancer, October 2008, at the age of 37. Marie was a pre-school teacher, a wife and a mother. "She was full of life and love," says author Marsha Holm. "One of her loves was for purses and I think she would have liked this one!" 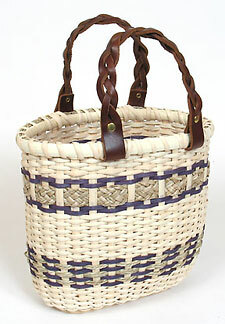 Author Marsha Holm has made 5 baskets (so far) and she chose some of her favorite materials to incorporate into Marie's Handbag: a wooden base, leather handles and braided seagrass. Thanks, Marsha, for sharing Marie's memory with us! Calculate Supplies for 1 to 20 Marie's Handbag baskets with the Basket Supply Calculator. The Supply List gives you the least expensive way to purchase the supplies for your quantity of baskets. View on-line or print to your printer. *This item has been rounded to 1 pound because it is less expensive to purchase 1 pound than to purchase the foot quantity. Call us TOLL FREE at 1-800-447-7008 Monday through Friday 8:00 A.M. to 4:30 P.M. Central Time. We will be happy to take your order. Remember...32 years of customer satisfaction and your satisfaction IS 100% GUARANTEED. Copyright © GH Productions Inc. All rights reserved.